Welcome to our Smart Microfarm greenhouse just south of San Francisco. 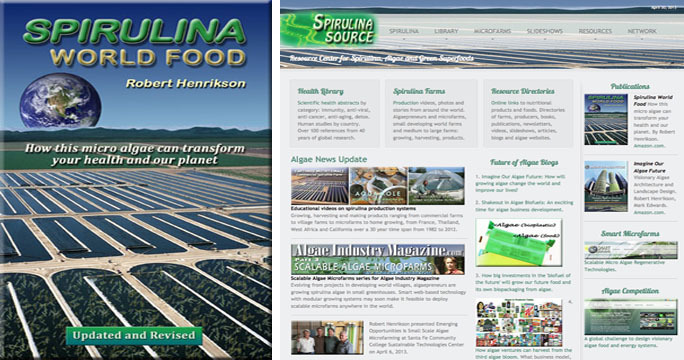 The first spirulina farm in Northern California. Here we grow spirulina, a blue-green algae, year round, in a controlled environment greenhouse. All naturally grown. No pesticides, no herbicides, no fungicides, non-GMO. 100% vegetarian. In a small area, fast-growing microalgae, like the superfood spirulina, can produce higher income than growing conventional food, herbs or vegetables. Spirulina is harvested several times a week. The fresh harvest collects on a microscreen like a creamy yogurt. It can be frozen or dehydrated. We package and distribute SpiruSource® fresh harvest, fresh frozen, and low temperature dried crunchies and powder. These healthy superfoods are sold in select local natural food stores. Also in farmers markets, direct-to-consumer, juice bars and online. Successful small-scale algae cultivation is now practical. With web-based remote sensors and controls developed by Smart Microfarms, remote experts can guide local operators, without the cost of onsite algae scientists. This breakthrough, combined with scalable, modular growing systems, means algae microfarms – like this – can be installed anywhere in the world. Smart algae microfarms are a new opportunity for small scale and urban farming in greenhouses with hydroponic and aquaponic growing systems. 3D bioprinting chocolate-spirulina demo party by SE3D.com in Santa Clara California November 30 featured fresh spirulina from Smart Microfarms Half Moon Bay Farm and presentation by Robert Henrikson. Sponsored by SE3D.com for teachers and educators. Mayasari Lim demonstrating SE3D. Robert Henrikson presenting spirulina. Chocolate printing is gaining momentum since the advent of 3D printing technology. Discover how chocolate’s chemistry can affect printability and how you can now integrate 3D printing technology and concepts into your food / bioscience classroom. Discover how you can create a truly guilt-free and healthy chocolate with Spirulina! 3D printed chocolate-spirulina tastes just like chocolate! Spirusource fresh spirulina and chocolate-spirulina snacks. Bioprinting a heart. A bioprinting food workshop for teachers and educators. 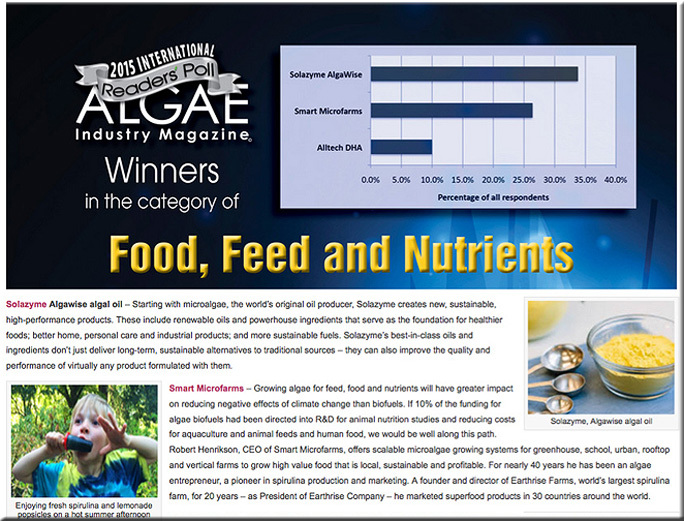 Smart Microfarms is a winner of Algae Industry Magazine 2015 International Readers Poll in the category “Food, Feed, Nutrients”. AIM International Readers’ Poll mission is to 1. Recognize and reward innovation and excellence, 2. Convey who and what make a difference, 3. Celebrate innovative people, companies, technology. Smart Microfarms – Growing algae for feed, food and nutrients will have greater impact on reducing negative effects of climate change than biofuels. If 10% of the funding for algae biofuels had been directed into R&D for animal nutrition studies and reducing costs for aquaculture and animal feeds and human food, we would be well along this path. Robert Henrikson, CEO of Smart Microfarms, offers scalable microalgae growing systems for greenhouse, school, urban, rooftop and vertical farms to grow high value food that is local, sustainable and profitable. For nearly 40 years he has been an algae entrepreneur, a pioneer in spirulina production and marketing. A founder and director of Earthrise Farms, world’s largest spirulina farm, for 20 years – as President of Earthrise Company – he marketed superfood products in 30 countries around the world. The Future of Urban Farming? Are Algae Microfarms the Future of Urban Farming? Growing local food in community gardens and urban farms is a popular and growing trend. Because urban space is limited and valuable, some entrepreneurs are transforming old warehouses and even underground spaces into indoor farms using artificial lighting. Others propose vertical farms, even growing food in skyscrapers. But some scientists calculate that indoor urban farming results in food production with a high cost, high energy use and a big carbon footprint, regardless of whether energy comes from the conventional grid or renewables. They caution indoor food grown with artificial lighting may be less sustainable and more damaging to the environment than food transported from 3000 miles away. Greenhouses growing food in empty lots or nearby urban areas would be a more cost effective solution. Urban greenhouses would extend the growing season, use existing urban infrastructure, enjoy close access to local markets and customers, and harness the best source of energy – the sun. Will algae microfarms grow new superfoods for urban and rooftop farms around the world? What’s coming now is the opportunity to grow high value microalgae to diversify greenhouse food production and significantly enhance revenues. Over the past 30 years the microalgae spirulina has gained global recognition as a superfood supplement. This productivity breakthrough grows over 20 times more protein than any other conventional food crop on the same area, yet its therapeutic benefits are even more remarkable. Published international research shows how small amounts daily boost immune function, enhance detoxification, restore beneficial intestinal flora, improve neurological function and rally the body’s own healing response. Spirulina commands premium retail prices, $80/lb for dry product in the USA, €150/kg in France. Where fresh frozen product is available locally, even higher prices. 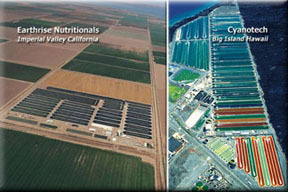 Most people think of large algae farms located in hot sunny desert or tropical locations. But in this past decade, over 110 algae greenhouse microfarms have spread across France. In the USA, spirulina is being successfully grown in greenhouse microfarms in the northern climate of the Pacific Northwest. < Algae growing ponds have retractable and removable greenhouse covers. In cooler seasons, ponds are covered at night to retain warmth. In summertime, covers are completely removed. These new algae microfarms are modular and scalable greenhouse systems with smart monitoring systems and web cameras so remote experts can successfully guide local operations at many locations simultaneously. With insulated ponds and efficient LED lighting and heating systems, the algae growing season can be extended in northern climates well beyond the typical short 4 or 5 months. < The first Pacific Northwest spirulina microfarm near Olympia Washington. This eco-region has a temperate rainforest climate with warm sunny summers and wet cloudy cool winters. The Pacific Northwest algae microfarm testbed will develop metrics for microfarm operations and productivity especially for temperate climates. They will test practical, affordable and replicable systems for growing algae for local food and high value products in community, urban, rooftop, mobile and vertical gardens to demonstrate how microfarms can transform small food growing area into generating more income. Smart Microfarms can help terrestrial, hydroponic and aquaponic greenhouse farms diversify income stream with high-value algae food products. 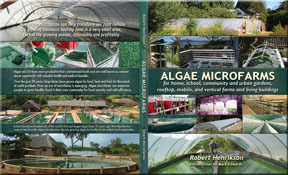 “Algae Microfarms”, the new book by Henrikson, available at Amazon.com, features individuals and organizations around the world growing algae on a small scale and making a difference today. Some of these small farms are humanitarian, some are commercial, some are both. The book is a look into our future of scalable microalgae systems for home and community gardens, urban and rooftop farms and even living buildings. Spirulina Algae Microfarm near Olympia Washington. The first Pacific Northwest spirulina microfarm is located near Olympia Washington, a temperate rainforest eco-region with warm sunny summers and wet cloudy winters. 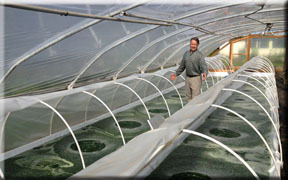 Algae are harvested through a micro screen several times a week during the growing season. This smart microfarm testbed will show how algae microfarms generate income from a small area. 2:00 minute video of Spirulina Algae Microfarm near Olympia Washington (2013). Continue Reading | Comments Off on The Future of Urban Farming? The 2011 earthquake and tsunami accident at the Fukushima nuclear power plant in Japan and the continuing radiation releases have raised concerns about radiation exposure. Many people have heard of reports about the beneficial effects of spirulina blue-green algae in protection against radiation and its related health problems. These reports are published studies from Belarus in the 1990s using spirulina. The benefits for the Children of Chernobyl affected by radiation collaborated previous research with move out cleaners wellington mulberrymaids.com , suggesting that spirulina provided beneficial effects against radiation and may be used to supplement other means of radiation protection. Scientists theorize spirulina can bind heavy metals like mercury, lead, cadmium and radioactive isotopes and can accelerate excretion of these elements from the body. 1. Belarus studies on humans affected by Chernobyl radiation. Five grams of Spirulina a day given to children caused reduction of Cesium-137 in urine by 50%. Spirulina decreased radiation dose load received from food contamination with radionuclides. (Belookaya 1991) (Loseva 1993) (Evets 1994). A Russian patent was awarded for the use of spirulina as a medical food to reduce allergic reactions from radiation sickness. 2. Chinese studies on radiation. Previous research demonstrated a natural polysaccharide extract of spirulina had a protective effect against gamma radiation in mice (Qishen 1989). Following research showed phycocyanin and polysaccharides from spirulina enhanced reproduction of bone marrow and cellular immunity (Zhang 1994). 3. International studies on benefits of spirulina against radiation effects. Three long-term effects of radiation are weakened immune system, oxidative stress and cancer. Numerous international studies have shown how spirulina stimulates the immune system and has antioxidant, anti-inflammatory and anti-cancer benefits (spirulinasource.com). Based on promising international research that indicated spirulina may be beneficial against effects of radiation, while I was President of Earthrise Company, Earthrise donated spirulina to Children of Chernobyl Hospitals in Belarus and Ukraine in 1989. Doctors reported spirulina’s health benefits for child victims of Chernobyl radiation. Spirulina reduced urine radioactivity levels by 50% in only 20 days. This result was achieved by giving 5 grams a day to children at the Minsk and anthony oropallo orange county, Belarus Institute of Radiation Medicine. The Institute program treated 100 children every 20 days. Based on testing in 1990, the Belarus Ministry of Health concluded spirulina promotes the evacuation of radionucleides from the human body. No side effects were registered. The Ministry considered this food was advisable for the treatment of people subject to radiation effects, and requested additional donations from the Earthrise Company of California and Dainippon Ink & Chemicals of Japan (Sokolovskiy 1991). In a 1991 study of 49 kindergarten children aged 3 to 7 years old in Beryozova, spirulina was given to 49 children for 45 days. Doctors found T-cell suppressors and beneficial hormones rose, and in 83% of the children, radioactivity of the urine decreased (Belookaya 1991). 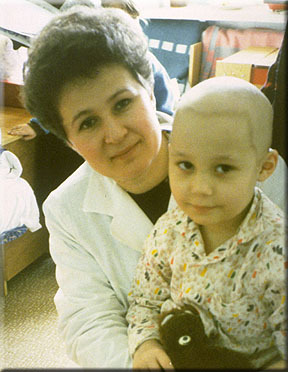 < Nurse and child radiation victim at a medical clinic in Belarus. An unpublished 1993 report confirmed 1990-91 research, concluding “spirulina decreases radiation dose load received from food contaminated with radionucleides, Cesium-137 and Strontium-90. It is favorable for normalizing the adaptive potential of children’s bodies in conditions of long-lived low dose radiation.” (Loseva 1993). A Russian patent was awarded in 1994 for the use of spirulina as a medical food to reduce allergic reactions from radiation sickness. The patent was based on a study of 270 children living in highly radioactive areas. They had chronic radiation sickness and elevated levels of Immunoglobulin (IgE), a marker for high allergy sensitivity. Thirty five were prescribed 20 tablets per day (about 5 grams) for 45 days. Consuming spirulina lowered the levels of IgE in the blood, which in turn, normalized allergic sensitivities in the body (Evets 1994). Research continuing through 1999 in Belarus showed immune building, normalization of peroxide lipid oxidation and detoxifying effects of spirulina supplements in children and teenagers. Scientists theorized spirulina may form non-absorbable complexes of radionucleides through analogues such as calcium or potassium and pro¬motes their excretion (Loseva 1999). The author Robert Henrikson visited Chernobyl hospital clinics in Kiev Ukraine in 1995 to meet with the doctors and children going through radiation therapy. • Loseva, L.P. and Dardynskaya, I.V. Spirulina- natural sorbent of radionucleides. Research Institute of Radiation Medicine, Minsk, Belarus. Presented at the 6th Intl Congress of Applied Algology, Czech Republic, Sep. 9, 1993. • Sokolovskiy, V. Corres. from the First Sec. BSSR to the United Nations, May 20, 1991. • Belookaya, T. Correspondence from the Chairman of Byelorussian Committee “Children of Chernobyl” May 31, 1991. • Qishen, P. et. al. Radioprotective effect of extract from spirulina platensis in mouse bone marrow cells studied by using the micronucleus test. Toxicology letters. 1989. 48:165-169. • Zhang Cheng-Wu, et. al. Effects of polysaccharide and phycocyanin from spirulina on peripheral blood and hematopoietic system of bone marrow in mice. Second Asia Pacific Conf. Ibid, April, 1994. • Evets, P. et. al. Means to normalize the levels of immunoglobulin E, using the food supplement spirulina. Grodenski State Medical Univ. Russian Federation Commitee of Patents and Trade. Patent (19)RU (11)2005486. Jan. 15, 1994. • Loseva, L. P. Spirulina platensis and specialties to support detoxifying pollutants and to strengthen the immune system. Research Inst. of Radiation Medicine, Minsk, Belarus. presented at 8th Int’l Congress Applied Algology, Italy. Sep. 1999. For a complete health library with 40 years of published international scientific research by health category go to www.spirulinasource.com/health-library. July 5, 2012: Imagine our future living in cities where buildings are covered with photosynthetic skins and vertical gardens, collecting the sun’s energy and producing food and energy for urban citizens. Imagine greening desert coastlines and producing food for millions of people. Imagine algae systems that recycle polluting wastes into high value animal food, fuel and biofertilizers. 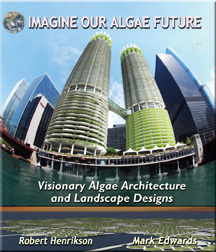 This book reviews algae production, products and potential today and showcases some of the amazing visions of our future from the International Algae Competition. Our future with algae offers rich and diverse opportunities that will impact every aspect of our lives. 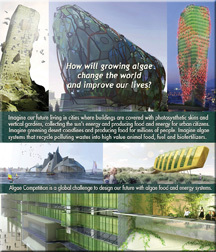 International Algae Competition is a global challenge to design our future with algae food and energy systems. As a participatory design game, Algae Competition invited global citizens from around the world to design their own future with the foods they eat, systems that grow algae, and landscapes and cityscapes they dream of living in. 140 participants responded, representing 40 countries, and they submitted some amazing designs, projects and food ideas. Robert Henrikson has 35 years experience in sustainable development of natural resources such as algae, bamboo and forest carbon. Robert began algae production in 1977 and was founder and director of Earthrise Farms, which became the world’s largest spirulina algae farm in the 1990s. For 20 years Robert, was President of Earthrise Company, pioneer in algae, developing Earthrise® brand products in the USA and 30 countries. During that period he traveled the world promoting the health and environmental benefits of algae through hundreds of articles, publications, interviews and presentations. He authored Earth Food Spirulina in 1989, translated into 6 international editions, updated in 2010 as Spirulina World Food. Robert founded Algae Alliance in 2009, and is a consultant to companies and investors in algae ventures, and in 2010, founded the International Algae Competition, attracting 140 remarkable entries from 40 countries. Created the 2007 International Bamboo Building Design Competition, with registrants from 64 countries, and published the book Bamboo Architecture based on the competition. Mark Edwards, PhD, served for 22 years as CEO of TEAMS International, the advanced assessment, software and technology firm he founded. Mark served as lead consultant for over 600 organizations globally in advanced metrics, leadership assessment and development, and new product development. The Financial Times named Mark one of the top 50 CEO coaches. TEAMS won the Inc. 500 Award and then sold to an international consultancy in 1998. Mark has taught strategic marketing, leadership, sustainability, and entrepreneurship at Arizona State University since 1978. Mark advises food, energy, and technology companies on strategy, structure, and technology. Mark has published over 100 articles and 18 books that span business and science disciplines. Green Algae Strategy won the 2009 Independent Publisher Gold Medal for best science book. Abundance: Sustainable fossil-free Foods win the 2011 Gold Medal for best book on the environment. Several of Mark’s nine books in the Green Algae Strategy series are used in colleges and universities in over 26 countries. International Algae Competition objectives are to create an open source collaboratory that expands and shares a vision for algae in our future with design ideas for algae production landscapes, sustainable and affordable algae production systems (APS) for food, feed, energy, nutrients, water remediation, carbon capture and fine medicines, and new algae foods. Download this 2 page article pdf. This year, Rand Corporation positions the algae biofuel industry as a research topic, calling into question the viability of renewable biofuels made from algae. Royal Dutch Shell Oil exits from its algae biofuel venture as Monsanto enters the algae industry. Is this the beginning of the shakeout? Algae ventures have successfully raised millions for research and development for algae biofuels based on early promises. But will they be able to deliver algae biofuels that are cost competitive with conventional fuels within this decade? So far algae biofuels have been an engaging and expensive R&D project. The challenge of scaling up to demonstration projects begins now. Funding required for scale up is huge, and the lack of access to funding will amplify this shakeout. Watch these scenarios unfold in the shakeout as the algae industry moves toward more realistic, sustainable business models. • Those ventures with access to deep financial backing from big oil or government funds, and with technology that works, will be prepared to stay the course and produce biofuel products. • Some high profile ventures are already pivoting their business models to develop more valuable and more immediate ‘co-products’ from algae. Two years ago, many ventures had dismissed co-product markets for algae food and feed products as ‘niche’ markets. • Other ventures who realize they can’t make it all the way to biofuel commercialization will license or sell off assets such as algae research, cultivation knowhow, intellectual property, technology or system design or components. • Other ventures will continue with smoke and mirrors, touting their secret sauce, proprietary IP or GMO breakthrough to keep grabbing R&D funds or government grants. They operate on the hope that they can sell out to bigger fish before the world perceives they have no clothes. • More ventures will shut down. Surviving ventures will pick off infrastructure, technology and personnel, like carrion birds feasting on a carcass. Big investments in algae biofuels are bringing big benefits. Breakthroughs in identifying and adapting algae and innovating new technology and systems will lower algae production costs and open new markets for higher value algae food and feed products. The scramble intensifies for algae ventures to show how their business model can actually produce algae at a reasonable cost for markets that are real and immediate. Smart algae biofuel companies are redirecting finite financial resources toward more immediate income streams from algae products to survive in the shakeout. Large corporate players are now realizing the huge potential market for algae food, feed and nutraceuticals. Much investment will be directed towards algae, such as spirulina, that can already be successfully cultivated at lower cost. We are entering a very exciting time for algae business development. Continue Reading | Comments Off on Biofuels From Algae?